The Metropolitan of Marthoma Church, the Most Rev.Joseph Marthoma from Kerala; Rev.Dr. Roger Gaikwad, General Secretary of the NCCI, Dr. J. A. Oliver, Secretary of APCC , Most Rev. Johan Dang and Rt. Rev. Dular Lakra from Gossner Lutheran Traditions at a press meet in Hyderabad on 18th August 2015.See Press note below. 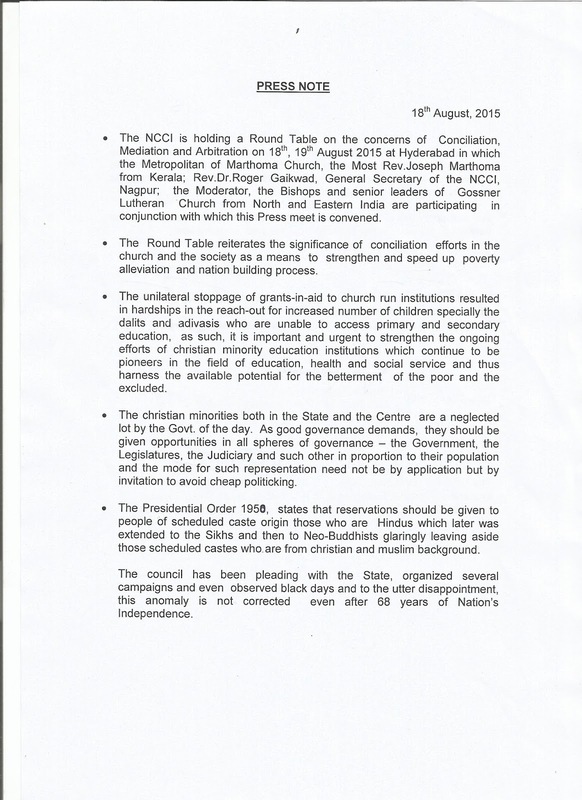 •The NCCI is holding a Round Table on the concerns of Conciliation, Mediation and Arbitration on 18th, 19th August 2015 at Hyderabad in which the Metropolitan of Marthoma Church, the Most Rev.Joseph Marthoma from Kerala; Rev.Dr.Roger Gaikwad, General Secretary of the NCCI, Nagpur; the Moderator, the Bishops and senior leaders of Gossner Lutheran Church from North and Eastern India are participating in conjunction with which this Press meet is convened. 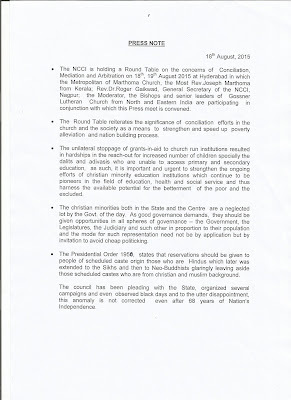 • The Round Table reiterates the significance of conciliation efforts in the church and the society as a means to strengthen and speed up poverty alleviation and nation building process. • The unilateral stoppage of grants-in-aid to church-run institutions has resulted in hardships in the reach-out for increased number of children specially the dalits and adivasis who are unable to access primary and secondary education. As such, it is important and urgent to strengthen the ongoing efforts of Christian minority education institutions which continue to be pioneers in the field of education, health and social service and thus harness the available potential for the betterment of the poor and the excluded. 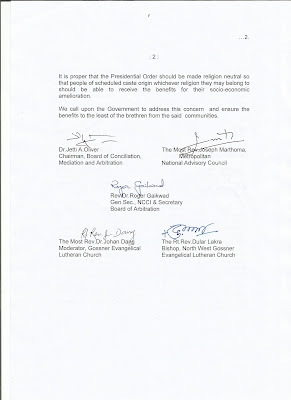 • The Christian minorities both in the State and the Centre are a neglected lot by the governments of the day. As good governance demands, they should be given opportunities in all spheres of governance - the Government, the Legislatures, the Judiciary and such other in proportion to their population and the mode for such representation need not be by application but by invitation to avoid cheap politicking. 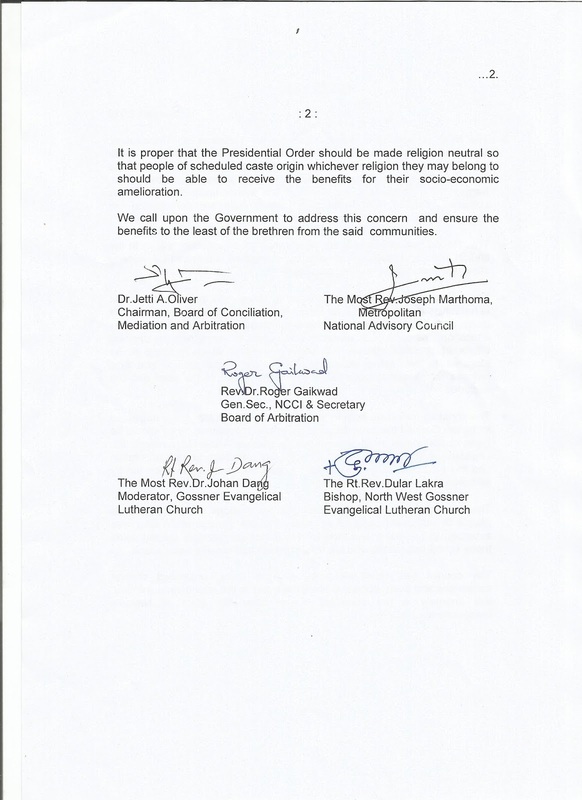 • The Presidential Order 1950, states that reservations should be given to those people of scheduled caste origin who are Hindus, which later was extended to the Sikhs and then to Neo-Buddhists, glaringly leaving aside those scheduled castes who are from Christian and Muslim backgrounds. The council has been pleading with the State, organized several campaigns and even observed black days and to the utter disappointment, this anomaly is not corrected even after 68 years of the Nation's Independence. It is proper that the Presidential Order should be made religion-neutral so that people of scheduled caste origin, whichever religion they may belong to, should be able to receive the benefits for their socio-economic amelioration. We call upon the Government to address this concern and ensure the benefits to the least of the brothers and sisters from the said communities.